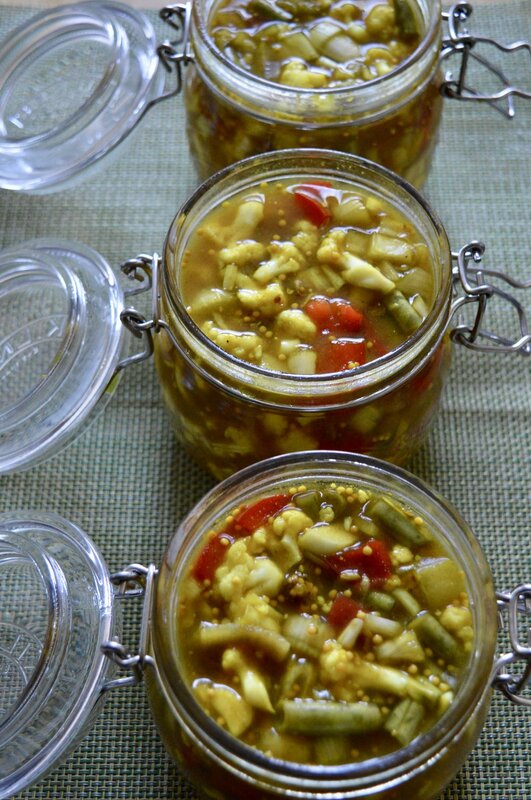 This traditional pickle condiment to pies and picnics makes great use of in-season vegetables (or hard fruits). The options in the recipe could be swapped for a combination of carrots, crisp apples, unripe peaches, courgettes, nasturtiums buds, radish pods, gherkins or cucumbers. Cauliflower is usually always there - although romanesco works well instead too. By salting the vegetables first but not cooking them they retain a really lovely crunch. Cut the vegetables into small 1-2cm pieces, put them into a dish and sprinklethe salt over. Cover and leave for 24 hours. Drain off the water that will have come out of the vegetables, rinse them well in cold water and drain again. Crush the coriander seeds and fennel seeds with a pestle and mortar. Mix into those the ground allspice, mustard seeds, mustard powder, turmeric and cornflour. Stir all these spices into a paste by adding a couple of tablespoons of the vinegar. Put the rest of the vinegar into a large pan with the sugar and honey. Heat until the sugar dissolves then add the spice paste and bay leaves. Simmer for 4 minutes. Take the pan off the heat and stir into it the drained vegetables, grated horseradish and slices of garlic. Pack into sterilised jars, pressing down with the back of a spoon to remove air pockets. Make sure the vegetables are fully immersed in the pickling liquid - add a little more vinegar if needed. Seal and store for 2 months before using.